On the last day - a gloomy one - of a tough season, New Zealand had a few bright spots to hang on to. 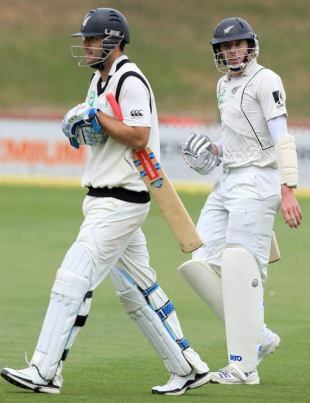 Of course, the series had been lost the day they were bowled out for 197 at the Basin Reserve. For the last three days, it has been all about whether they could salvage a draw, with or without the help of a circumspect India and unpredictable weather. That they managed to take the game to a point where rain could be of any consequence was the only positive they carried out of this Test. It would have been easy for Ross Taylor to throw it away, with the series already gone. But he went on to score a century, and thwart India's push for a 2-0 win. "India obviously outplayed us in all departments, apart from our first couple of morning sessions where we had them at 200 for 6," captain Daniel Vettori said. "From then on in, it's been India's game. There have been a couple of pleasing aspects, the fight that Ross Taylor and James Franklin showed to give us even a chance of saving the game." Jesse Ryder, the revelation of the season, will perhaps the brightest star for New Zealand. Bigger challenges follow for him, with the IPL next week, and the Twenty20 World Cup to follow. He will be going out of his comfort zone, to team up with strangers. One man who won't be doing that is Chris Martin, who rivalled Ryder in terms of popularity with the New Zealand crowds. Martin's has been a successful comeback from injury, his unrelenting spirit with the ball representing New Zealand's spirit, and his batting providing the comic relief. He might not be going anywhere touring in the next few months, but at 34, with 160 wickets, Martin could have thoughts of walking into the sunset. "If we can avoid him signing any county contracts, we will keep pushing him," Vettori said. "But he is 34…and I can see that he is excited about Test cricket again, and his performance in this series has been fantastic. Hopefully he is a guy who can continue like a Glenn McGrath till 37 or 38. He deserves 200 Test wickets." Vettori however, didn't hide the shortcomings of the team, and the application of the talent. "There is a number of things we have to improve," Vettori said. "We have to improve our consistency as a side. We do things well for a period of time, but the longevity of what we do is the thing that is causing me the most stress. You see it all the time that we can be a good team, but we are not delivering it often enough. We have just got to keep finding a way to do that, there is talent in the team, but we are not justifying the talent we have there with the level of our results." One of the aspects Vettori will be dissatisfied with will be his own bowling, or the lack of results thereof. Especially in the second innings of the Napier Test, when New Zealand needed the spinners to stand up. Vettori ended with seven wickets from the series, at an average of 52.28. "I didn't take as many wickets as I would have liked," he said. "As a spin bowler, or as any bowler, all you can try to do is create chances, and if you create chances you are happy with it. Still there are expectations about a result, and the results as a bowler haven't been as good as I would have liked." With the few positives cherished, and the improvement areas identified, New Zealand want to get into somewhere in the middle of the Test rankings, as opposed to the bottom - No. 8 - they are placed at right now. "I know we aspire to be the best in the world, and you have to do that," Vettori said. "We like to see some improvement, obviously getting off the foot of the table. If we can get to fourth or fifth in the next 24 months, that will be very pleasing."